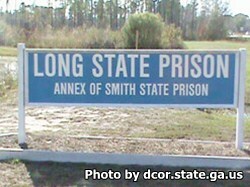 Long State Prison is located in Ludowici Georgia. It houses medium security adult male inmates. Currently this facility can hold 232 offenders. Inmates are housed in Four large open dormitories with bunk beds. Inmates who are eligible can participate in work details that offer labor support for the surrounding counties. Inmates are encouraged to participate in courses to learn to read, earn an adult basic education and get a GED. Religious programs, including worship/prayer and bible study are offered by the Chaplains office. Counseling for inmates help them to achieve behavioral modification and prepares inmates for re-entry into society. Vocational skills taught at Long State Prison include culinary arts, waste water treatment, custodial and building maintenance, landscaping, auto repair, forklift operator, and basic computer courses. Visiting occurs on Saturdays, Sundays and State recognized Holidays from 9am-3pm.